We could have taken the main highway, but decided to take the longer 32 km (19 mile) coastal route. It wasn't long before we came across a beautiful beach, and it even had a parking area that would have made for a great dry camping spot. Hard to believe this is only a few miles north of the hustle and bustle of Puerto Vallarta! Kevin, and the beautiful beach. But, we have to get moving. A little bit north every day. Trying to get to Mazatlan in a week or so! Most of the road looked like this. A little narrow, and slow going. But there was hardly any traffic, and we're in no rush. Turning right from Punta de Mita, the road turns into this! In the last year or two, Fonatur (the Mexico Tourism Board) has begun development of this coast 35 kms north of Puerto Vallarta. There are now a couple of big resort hotels, and more being built, along with condos and residences. We think it's funny that they build this big four lane road in the middle of nowhere, but you have to take the skinny little two lane road to get there! And then, just like that, it's back to a skinny little two lane road again. 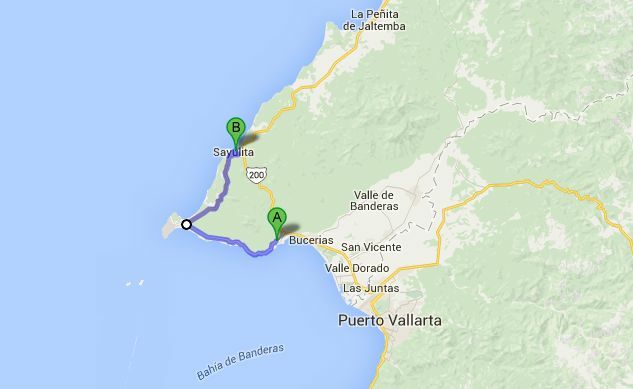 We pulled in to the busy little beach town of Sayulita. And do I mean busy! What a zoo. Not ideal, but it'll do for one night. We found Dan and Karen and went for a walk around town with them. They also had other friends visiting. Like I said, Sayulita is a busy little town. Not really our style though. It's inundated with tourists, and it's one of these places where many things are priced in U.S. dollars in order to take advantage of the tourist's money. And, more signs in English than in Spanish. But, many people simply love it here, and we know that we're the odd ones when it comes to this kind of thing. A local woman selling tourist trinkets. You still see the odd horse riding through town though! There was some kind of Christmas thing going on in the central plaza. This little guy didn't look thrilled! Yesterday's drive...only 32 kms (19 miles). But, we'd better get going. We have another "long" drive to do today! Thanks to those of you buying through our Amazon links and supporting our travels. Readers of this blog have purchased 55 items so far this month! Here's a last minute gift idea for your dog. Highly rated, and on sale at 50% off! Oh man. Santa must be used to the heat. Something I could never quite get used to in the tropics. I would just marvel at the guys out cutting the grass or up on a roof somewhere, completely covered from head to toe. Also noticed that most everyone who lived there, tried to stay in the shade as much as possible. Hm, funny 'bout that. I would think that he must be. We see that a lot when we are down here in Mexico, most Mexican men wear long pants or jeans unless you are much further south then you may see more of them in shorts. Also we have noticed that the younger generation are more likely to wear long shorts but only when you are along the coast once you leave the coast they are back into pants. We tend to stay in the shade ourselves, we don't mind walking on the beach but we can't sit out on the beach anymore. Perfect travel day, we get to do those once in a while too. We are not crazy about the tourist towns, but don't see much else here when we are close to the border. It is funny that Sayulita is so busy yet two towns down the road it is so much quieter and definitely more like a Mexican town. We prefer the quieter towns! I would expect that some of them are from China and some others from Guatemala too. The 'local woman' selling things is actually from San Juan Chamula near San Cristobal de las Casas in Chiapas. She has either fled or been booted out of the community. Thanks Kathe, I thought that she looked like she was from Chiapas. Also the crafts that she was selling look like they are from that area too, that's why I mentioned in an above comment that some of the crafts looked like they were possibly from Guatemala, as they are very similar. I think I will get Mr Sft to pose with his Santa hat and sunglasses in Thailand. We are off to Vietnam tomorrow, then Laos and Thailand for Christmas. A whistle stop trip really but so looking forward to it. Enjoy those beautiful beaches R&K! I want to see that picture when you take it. Hope you are having a great time! Oh...Sayulita! Years and years ago, we stayed here regularly; same RV park but the town was so much smaller. The last time we were down, 2010, we checked it out, and...no way. We spent a month just north in Lo de Marcos. I still love that whole area and look forward to returning...but not to Sayulita in the MH. Totally agree with you. We would pick Lo de Marcos over Sayulita any day!